build team strength and unity. Ultimate is one of the fastest-growing sports in schools, intramurals, rec centers, and clubs throughout the United States and the world. It is also a sport that has been sorely lacking in current resources for teachers, coaches, and players—until now. Essential Ultimate: Teaching, Coaching, Playing contains all you need to know about teaching and coaching players to learn and achieve in the sport. The book also includes drills for individual skills and team tactics to help players prepare for competitions. Essential Ultimate is written by Michael Baccarini and Tiina Booth, national junior championship coaches with more than 45 years of combined playing, teaching, and coaching experience in Ultimate. Their experience includes coaching beginners through the most elite, who have won gold and bronze medals at the WFDF World Championships. 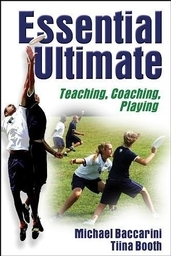 Through Essential Ultimate, Baccarini and Booth introduce you to the basics of the sport and prepare you to teach, coach, and play it. In part I they focus on the principles of throwing and catching and explore individual offensive and defensive skills as well as team offensive and defensive concepts and strategies. In part II the authors guide you in developing team unity and strength. They detail how to start an Ultimate program in schools, recreation centers, clubs, and intramural programs. They offer expert advice on developing championship teams, including the psychological preparation necessary for competing at your best. They also provide information on how to develop a fitness and conditioning program. As a fun, cost-effective recreational sport, one of Ultimate’s appeals is in being self-officiated. This requires players to participate in fair play, teamwork, and good sportsmanship, helping them develop responsibility and character. With its thorough coverage of the sport, Essential Ultimate will also help players improve their skills—and aid coaches and teachers in applying the information in a variety of settings, thus making it an important resource for anyone interested in the world of Ultimate. Chapter 1. What Is Ultimate? An instructional guide for physical education teachers and recreation leaders and for high school, college, and intramural coaches and players. Michael Baccarini, BS, is director of physical education at the Paideia School in Atlanta, Georgia. He has been playing Ultimate since 1978 and has taught and coached it for the past 13 years. Coaching the U.S. boys' junior Ultimate team with Tiina Booth, he has won two world championship titles (1998 and 2004) and received a bronze medal in the 2000 World Championships. He also coached the U.S. boys' junior Ultimate team to gold at the 2006 World Championships, has won two national high school championships, and he finished second in a third championship (in a match against Tiina Booth's team). Baccarini has led several coaching certification clinics for the Ultimate Players Association's Youth Outreach Program and served as national junior director for the UPA from 1999 to 2002. He is also a veteran Ultimate youth camp director; he founded and developed the Paideia Ultimate Summer Camp into a large and successful sports camp. Tiina Booth, BA, is an English teacher at Amherst Regional High School in Amherst, Massachusetts. She won national high school championships in 1998, 2003, and 2004 as coach of the ARHS boys' team. An Ultimate player and coach for more than 25 years, she also won world championship titles as coach of the U.S. boys' junior Ultimate team in 1998 and 2004 (coaching with Baccarini). She is the founder of the oldest high school Ultimate tournament in the United States—the Amherst Invitational, founded in 1992. She cofounded the national high school tournament in 1998. Booth is a trainer for coach certification for the UPA and is the founder and camp director of the National Ultimate Training Camp, the first overnight camp for high school Ultimate players. NUTC has attracted players from throughout the United States, Canada, and South Africa. In 1997, Booth was featured in Sports Illustrated's “Faces in the Crowd” for her coaching achievements, and in 2005 her team had a record of 57-3, including more than 20 wins against colleges as well as a college tournament championship title.